Houzz 81 of our visitors have told a friend about this plan. Question: We have a customer interested in modifying plan and would like to know if it is all conventional framing. He doesn’t want any wooden I beams at all and wants it to be all conventional framing. Answer: The plans is framed using roof trusses and I-Joists for the floor. Answer: Electrical panel is located based on where the electrical runs up to the house. Mechanicals are not located on the plans. However, they would be in the basement for the Basement option and in the attic for the crawl or slab options. Question: How many square feet is the 3 car garage please? Answer: Garage is 720 sq.ft. Question: Hello, I'm looking at plan 92465. I really like this plan but have a couple questions. The first one is, from the second level floor plan it notes that the area in the back left corner (over the master bedroom) is open to below. Does this just mean that the ceilings in the master are open, or is it really looking to the loft? Also, in the kitchen, the area close to the windows on the back side of the house seems to be unused. Is this for a nook or breakfast area? Or is there a specific purpose for this open space beyond the counters? Also, is the curved counter a eat at bar where stools can be placed? Is the bar two different levels or all one flat surface. My last question is, if we were to have a basement with this house, would the basement stairs go right underneath the stairs leading to the second level? Is this plan designed for this? Thanks for your help! Answer: Bedroom 2 does not overlook the master. This means the master ceiling has a high vaulted area with clear-story windows. The open area in the Country Kitchen is for a small table for a nook/brkfst area. Curved area is indeed for a brkfst bar/stools – either raised or at standard counter height. Lastly, yes, the stairs to the basement go under the current stairs leading to the upper level. Question: I don't see a placement for the hvac or water heater? And what does the interior elevations include? Answer: Mechanicals are located in the field by the contractor. Interior elevations are some cabinet views. Answer: 47x32 is the main footprint of the house only. This design will not work with dropping the whole second floor roof line. Question: is the CAD file for this plan in .dxf or .dwg format? Question: What is all included with the purchase of the CAD File? 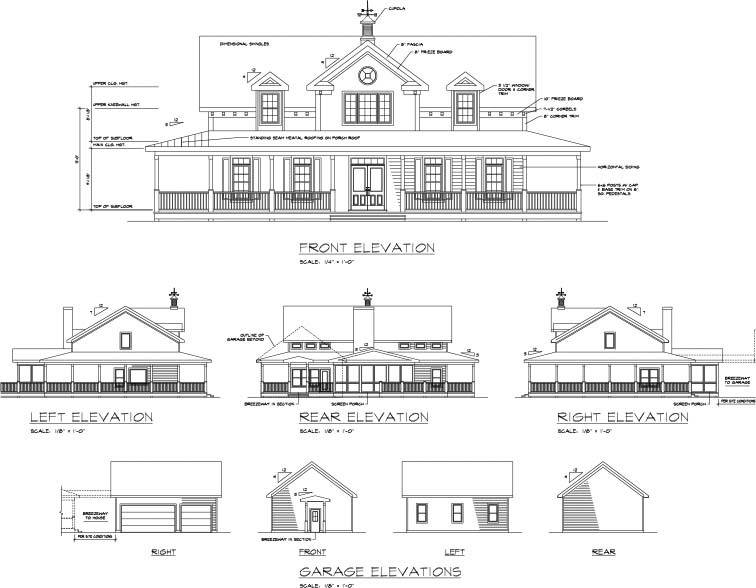 Elevations? Sections? MEP Layouts? Details? Click Here to download a free PDF Brouchure of Plan Number 92465.